Prepared in 20 minutes or less plus 30 minutes to bake. Position rack in the middle of an oven preheated to 375°F. Butter a large baking dish. Sprinkle the garlic over the bottom of the baking dish. Layer half of the potato slices, in overlapping rows, over the garlic. Sprinkle lightly with salt, fresh pepper and nutmeg. Spread the onion slices evenly over the potatoes, then layer the remaining potato slices over the top, arranging them beautifully. Gently pour the milk evenly over the potatoes and add 1½ cups the heavy cream. Sprinkle with salt and fresh pepper and a touch more nutmeg. Bake uncovered for 40 minutes basting each 10 minutes with a large spoon and the pan’s juices. 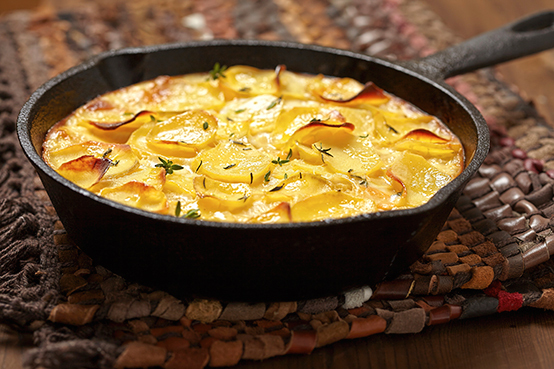 During the next 20 -35 minutes, baste the golden brown potatoes with the remaining 1½ cups heavy cream. Serve immediately. Serves 10.